Fiona Knox lost her fianc and her flower shop--but when she flies to Scotland to inherit her godfather's cottage and possibly magical walled garden, she may lose her life as well when she's swept into a murder investigation. Florist Fiona Knox's life isn't smelling so sweet these days. Her fianc left her for their cake decorator. Then, her flower shop wilted after a chain florist opened next door. So when her godfather, Ian MacCallister, leaves her a cottage in Scotland, Fiona jumps on the next plane to Edinburgh. Ian, after all, is the one who taught her to love flowers. But when Ian's elderly caretaker Hamish MacGregor shows her to the cottage upon her arrival, she finds the once resplendent grounds of Duncreigan in a dreadful shambles--with a dead body in the garden. Minutes into her arrival, Fiona is already being questioned by the handsome Chief Inspector Neil Craig and getting her passport seized. But it's Craig's fixation on Uncle Ian's loyal caretaker, Hamish, as a prime suspect, that really makes her worried. As Fiona strolls the town, she quickly realizes there are a whole bouquet of suspects much more likely to have killed Alastair Croft, the dead lawyer who seems to have had more enemies than friends. 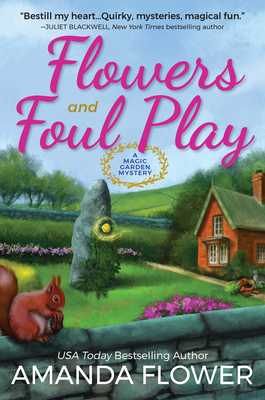 Now it's up to Fiona to clear Hamish's name before it's too late in Flowers and Foul Play, USA Today bestselling author Amanda Flower's spellbinding first Magic Garden mystery. Amanda Flower, a USA Today bestselling and Agatha Award-winning mystery author, started her writing career in elementary school when she read a story she wrote to her sixth grade class and had the class in stitches with her description of being stuck on the top of a Ferris wheel. She knew at that moment she'd found her calling of making people laugh with her words. She also writes mysteries as USA Today bestselling author Isabella Alan. In addition to being an author, Amanda is a librarian in Northeast Ohio. This is her first Magic Garden mystery.